You’ve had a huge year since the release of Marcata, touring around Europe. How are you dealing with the relentlessness of it all? We sleep on planes, buses; just this morning we were on a Ryanair red-eye flight and caught maybe half an hour. We’re just about at a level now where we can pick and choose what we want to do, though, whereas before we’d do every show, every support slot and every tour because that’s just what you have to do. That would be blasphemy. If any of us ever did that the rest of us would slap the sh*t out of them until they went up and played a proper gig. People pay good money to see you. You can’t phone it in, it doesn’t matter how tired you are. It’s all about integrity, and even if you are feeling bad, there’s nothing better than a gig to get you going. Especially when you play like us. What’s been the biggest lifestyle change over the past year or so? We’ve been constantly broke, that’s probably been the biggest change. We all had jobs, money, but what do you want? Do you want a job or do you want to do something with your life that doesn’t involve just working for some c*nt? The album was our pick for album of 2011 on Goldenplec.com. Was it an album built around the live act, or was it a live act built around a stunning album? Well we wrote the album as a band in a room. We tried out the songs live upstairs at Whelan’s, so I think it was a bit of a mish-mash of both. We knew we had to get the energy of the live show on the record, so I suppose it was built around the live thing. Getting good songs was the most important thing. Even since then, the songs have become different. We’ve been playing these songs for a year and a half to two years, and they’ve changed from the album versions. We’re adding parts here and there, basically feeding off the audience, having a bit of buzz. If we played them the same way for two years you’d get very bored. We thought it was quite contentious that you didn’t get nominated for Choice. Were you bothered by that? You used to be an indie band, and then evolved into this rock and roll super group. Which bands influenced that move? Most of all, which indie bands influenced that move? A lot of indie bands influenced that. What we were doing at the time was shite, we were trying to get played on the radio and doing all these things that weren’t really what we wanted to do. We’re obviously all big Thin Lizzy fans and we all love rock and roll. Mark bought a few blues tunes, and we got into the tracks with heavy bass lines played over them. That’s how we got into it, I think it just gradually built from there. We learnt how to play guitar to the Thin Lizzy song book. Just going back to that, that’s why we started to do this. It was so much more natural for us to play this way. When we were doing that indie thing we were trying way too hard. We should have just let it be more natural. Rock ‘n’ roll was the thing we all agreed on. We swapped our Converse for boots, that’s all it was! You had a track used by Carlsberg in their advert ‘The Pledge’. When you were writing Marcata. Could you ever have imagine that the music would be used commercially? Never. When we were recording it, we thought nobody would ever play it on the radio. I mean they do at night time, which is great, but we knew, and needed to accept that we couldn’t build a fan base through radio; that we’d have to go out and play hundreds of gigs. We played a hundred gigs last year. It’s great that they used it, but no, we don’t see the band as a commercial band. We’re not against it, we just don’t expect it. There seem to be a lot of Irish bands in adverts at the moment. It’s because we’re cheap. That’s the truth of it. You have a real sweat box thing going on with your live shows. How have you found the step up to bigger venues? Well we’ve only really stepped up in Ireland. The Academy was amazing; we felt we were still able to maintain that intimate gig buzz in a bigger venue. In the UK, we’re basically still doing what we did in Dublin a year ago. It’s the same with festivals, and we’re still trying to maintain that closeness. It’s going to be interesting trying to keep it intimate supporting The Foo Fighters! We’ll just stay together, sit tight at the front of the thing. You don’t fill a stage like that straight away. We’ll do what we did at Oxegen, stay in the centre, and work on filling it out later. Black Keys added two more dudes to the band for that arena set up. I think if we got a huge riser for Shane and we were all miles apart it just wouldn’t work. Considering your roots, what do you make of the loss of Crawdaddy, the Lower Deck, etc? Sh*t happens. Someone else will put on a gig somewhere else. It’s shite that they’re closing down, but there’s nothing anyone can do about it, it’s a shame. The options are starting to get limited, but you don’t have to play venues. Play a gig in someone’s house. We did that, and why not? As a young band, you need to be innovative. Then it really is your gig, and you control everything. You can put The Minutes johnnies on the couch. You can rent a PA for 200 Euro. Just do it. Will the follow up to Marcata be a slow-burner, or will you be trying to strike while the iron is hot? We have a collection of new songs, but I don’t think we’re going to get going until it’s really, really good. It has to be the best that the band can do. It’ll probably be next year; we can’t just put out the same record again. We’re going to go away and think about it a bit. The live new ones at the moment are in a similar vein to the first album. It’s a classic second album. What have you been up to on tour? This tour’s been quite quiet actually. Except for Aberdeen. Aberdeen was a total shower. We literally only saw the main street, and that was it. People were puking up, sh*t everywhere. It’s too mad for us. JD Roots is about the influence of home towns on your music. What about Dublin has influenced your music? Obviously Thin Lizzy, Phil Lynott. My Bloody Valentine and Whipping Boy are big ones for us, too. That’s why we’ve done it, really, the three bands that are doing it are all different, with different tastes. It’ll be interested to see what comes out of it. It’ll be an interesting gig in May. We’re used to working together and we all have our little quirks. Six or seven people in a room will be different. It’ll be good to see how other bands work. We’ll be there in rehearsal for three days. We could do you a gig of our sh*t now, but we’re going to have to think about how to do the best representation of the songs. 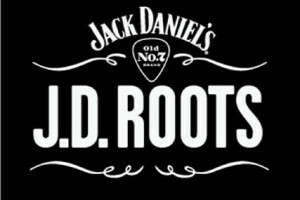 What will come next after JD Roots? Just lots of festivals. French festivals, German festivals, that’s what we’re planning to do. They’re the best buzz of the summer. Hopefully lots of UK and Ireland ones, too, and it’ll be good to see what the audience reaction is like in different places. Time will tell, but we’ll be busy. Hopefully some more American stuff, too. The first American tour will be a big one, whatever we learnt on the Flogging Molly tour, we’ll learn more from this. It should be special. The Minutes play JD Roots alongside The Delorentos and We Cut Corners this Friday, 18th May.